This comprehensive Factory Service manual is the same manual issued by Austin to their dealers and technicians. It's an absolute wealth of information that will help you maintain, repair and restore your Austin. 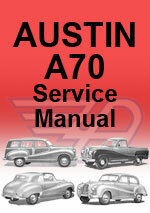 This Austin Repair Manual is in printable 'pdf' format. The following is a list of information contained in this Austin Repair Manual. Austin A70 Hereford, Countryman, Pick Up, Coupe, Convertible Workshop Service Repair Manual $8.99 Immediate Download!